James Pappoutsakis was born in 1911 in Cairo, Egypt of Greek parents. He came to Boston as an infant and attended the Boston Latin High School. Upon graduating from high school he attended the New England Conservatory of Music where he studied with Georges Laurent, Principal Flute of the Boston Symphony. In 1937, he joined the Boston Symphony as Assistant Principal Flute and Principal Flute of the Boston Pops. He toured Japan and Australia with the Boston Symphony as Principal Flute, conducted by Charles Munch. Pappoutsakis was the soloist with the Zimbler Sinfonietta on their tour to Central and South America. In 1960 and 1968 he played concertos by Telemann and Bach with the Boston Symphony in Boston and at Tanglewood, and was an occasional soloist with the Boston Pops Orchestra, conducted by Arthur Fiedler. Mr. Pappoutsakis taught at the New England Conservatory of Music, The Longy School of Music, Boston University, and the Boston Conservatory. Remarkably, eighteen of his pupils went on to win Fulbright Scholarships in Europe and still more took their places in symphony orchestras and in teaching positions at various colleges and high schools across America. He was famous for his vibrant, singing, expressive flute tone which he successfully taught his students. He was an incredibly dedicated and gifted teacher. He was married to Louise Came Pappoutsakis, former harpist with the Boston Symphony, and they had one daughter, Anita. 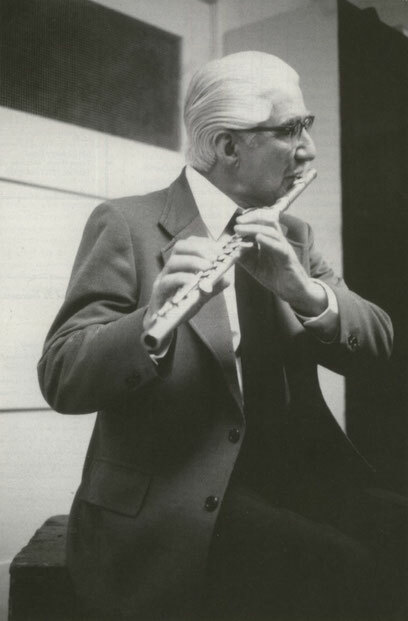 Mr. Pappoutsakis left his position in the Boston Symphony a year before his death. He made a series of cassette recordings of his ideas on teaching and playing the flute. These recordings are the foundation for the book by Ms. Barwell. He continued to teach at his home in Brookline, Massachusetts, until a month before his death from complications of emphysema in 1979.